Plum Curculio (PC): About 6% of beating tray samples have been positive for PC adults. Some of our most active sites are catching multiple adults in a single sample. This is about the same frequency as last week, but individual sample levels are higher. As soon as pollination is complete, growers should have bees removed and treatments should be applied. PC should not be ignored since it can result in larval infested fruit. Fruit samples were recently started and we find that 37% of our samples are positive for some level of pc scars. The egg scar injury range of goes from 1 to 26 berries in a 1000 berry sample. Avaunt and Imidan are two of the better insecticides available for PC control. They both control PC, cranberry Fruitworm, and leafrollers, but not aphids. Imidan may be better saved for when we start catching spotted wing drosophila, since Avaunt does not control SWD. Life Cycle. In New Jersey, PC completes a single generation a year in blueberries. This insect overwinters as an adult in leaf litter. Adults become active during bloom and feed on young fruit just after bloom, causing feeding scars. 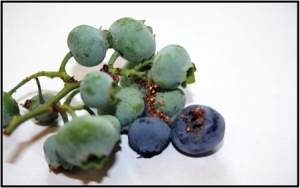 We have noticed that in the absence of fruit, PC adults feed on blueberry flowers (petals). Females lay eggs in the fruit causing crescent-shaped oviposition scars (see photo). White maggot-like larvae develop inside the fruit (one larva per fruit). Feeding by the larvae causes fruit to develop prematurely and fall off the bush. Mature larvae exit the fruit to pupate in the ground, and become an adult in July and August. If berries are picked before they drop, PC larvae can contaminate harvested fruit. Monitoring and Control. To monitor PC populations, scout for the semi-circular scars on the fruit. Sampling should be biased towards field edges or infields that border woods and hedgerows. PC infestations are more common in weedy fields and those with sod middles. This pest is more of a problem on early maturing varieties. No threshold has been established, so treatment is mainly based on past history and an estimate of damage to fruit. Control methods target the adult stage. Although adults can be present during bloom, no chemical controls are recommended at that time. Chemical controls should be applied as soon as bees are removed. Control options include Imidan, Avaunt, Danitol, Brigade, Mustang Max, and Diazinon. See information below on the use of pyrethroids for plum curculio control. Aphids: About 51% of shoot samples are positive for this pest. This is an increase since last week. They are mostly single aphids with occasional colonies starting to appear. About 10% of our samples were above the 10% shoot infestation level. Thrips: Thrips are present at very low levels in some locations. The highest levels seen were 15-20 thrips per 100 flower clusters. Now that petal fall is almost complete, this pest should pose no concern. Leafrollers and Other Leps: About 1% of beating tray samples have been positive for worm larvae and 6% of shoot samples have been positive. None of these have been over the 5% shoot infestation threshold level. Cranberry Fruitworm (CBFW):Trap captures have increased in Atlantic County, indicating that the adult flight is now underway. Treatment timings should be very soon, depending on the material being used. With high populations 2 applications may be needed, with the first spray being an IGR and a second spray being a standard insecticide. Lower populations may require only one application of a standard insecticide. Life Cycle: CBFW has one generation a year. It overwinters as a fully-grown larva within a cocoon made of silk and soil particles (hibernaculum). Pupation occurs during the early spring and moths begin to emerge during the second-third weeks of May (adults started to emerge last week in Atlantic Co.). Male moths emerge 3-4 days earlier than females. Adults are brownish gray with a pair of white markings on each forewing (see photo). The eggs are pale-green, flat, and are laid singly, mostly along the inside rim of the calyx cup. Eggs hatch in 5-7 days and the newly emerged larva is pale yellowish-green. Upon hatching, larvae bore into the fruit usually near the junction of stem and berry. The larva remains inside a fruit until its content is consumed, and then it moves to another fruit. A larva may feed on as many as 5-8 berries. Infested berries are contaminated with larval excrement which can be seen near the entrance hole. CBFW infestations can be recognized by the presence of webbings filled with excrement in berries (see photo). Infested fruit prematurely drop. Larvae drop to the ground under blueberry plants beginning the third week of June and build a cocoon. Monitoring: Time of treatment can be established based on data from pheromone traps. Based on a degree-day model from Michigan State University 85 degree-days are required from first male capture –biofix– to egg laying. The number of males caught in the traps provides information on the presence and distribution of CBFW within a field. Traps are usually placed at the wooded borders of fields, where pressure tends to be high. Growers with a history of high CBFW population should especially be aware of the importance of monitoring. In addition, eggs may be scouted for after early fruit set. Larval infestation is difficult to detect early in the season, but as larvae grow, the increasing numbers of fruits affected and frass produced provide clear indication of infestation. Control: CBFW can be controlled by registered insecticides. Either one or two applications may be needed, depending on the population level. If trap counts are high, then an early application of an insect growth regulator (Intrepid, Confirm, or Esteem) may be used when the first eggs are laid and start to hatch. Timing for this 1st application would be this week. In New Jersey this may be just prior to the peak flight. This would be followed by a second application soon after bloom. Post-bloom applications with broad spectrum materials (such as Danitol, Asana, Diazinon, or Imidan), or with newer softer materials such as Assail, Avaunt, Altacor, or Delegate can be done 7-10 days following the first application and after bees are removed. If trap counts indicate a lower population, then a single insecticide application may be made post-bloom i.e., 7-10 days after peak flight (expected next week). 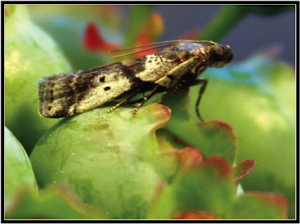 Growers who wish to use selective insecticides, especially for the control of Lepidopteran pests, are encouraged to do so. These compounds are safer to humans and the environment. Confirm and Intrepid are insect growth regulators (IGR) with activity only against caterpillars and have no effect on any other insects. Esteem is also an IGR that is also effective on cranberry fruitworm and scale (at a different timing). IGRs are safe to bees and thus can be used during bloom. Delegate is an insecticide with activity against caterpillars and toxicity to thrips. Assail is a neonicotinoid insecticide active against cranberry fruitworm, aphids, and thrips. Altacor is a newly registered insecticide in blueberries and is very effective against caterpillars. Delegate, Assail, and Altacor should be used only after bees are removed (if needed Delegate can be used to control thrips during bloom but applications need to be done at dusk to prevent bee exposure as Delegate is highly toxic to bees). If cranberry fruitworm is your only concern, growers can use Confirm, Intrepid, Esteem, Delegate, or Assail (see recommendations above for timing). IGRs (Intrepid or Esteem) would be a good choice for a first application during or just after bloom, if the population is high. The reason that IGRs should be used for the 1st or “early” spray is that they are ovicidal and larvicidal, so to get maximum benefit they should contact the egg before hatch. If a 2nd application is needed (after bees are removed), Altacor, Delegate or Assail are good choices. If cranberry fruitworm and thrips are your primary targets, you may apply Assail, Delegate, or Lannate. Assail and Lannate will also control aphids (see below). If aphids are your primary concern, and you do not have major caterpillar pressure or plum curculio at this time, then use Assail, imidacloprid (e.g. Admire Pro), or Actara in your first post-pollination application (late May until early June). Assail will also control cranberry fruitworm and thrips. These compounds are very effective against sucking insects. Alternatively you may use a broad-spectrum insecticide such as Diazinon or Lannate. These broad-spectrum insecticides will also control caterpillars and other pests. If you want to use a broad-spectrum material in late May and early June (for caterpillars, aphids, leafhoppers, thrips, plum curculio, etc. ), you should choose one of Imidan, Diazinon, Lannate, or pyrethroids (e.g. Danitol, Brigade, Hero, Asana). Imidan will control all pests normally targeted at that time, but will not control aphids. Pyrethroids can also be used but are generally weak on aphids, but control most other pests (as listed on the label): Asana – cranberry fruitworm, Japanese beetle, leafhoppers, and blueberry maggot; Danitol – plum curculio, cranberry fruitworm, Japanese beetle, obliquebanded leafroller, and blueberry maggot. 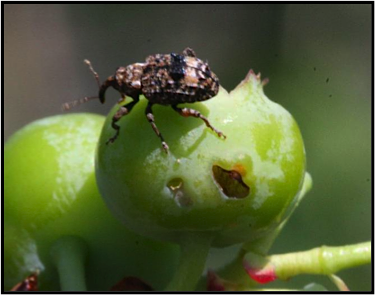 While the pyrethroids will control plum curculio, high rates need to be used to achieve control. Pyrethroid insecticides are very toxic to natural enemies, and thus will disrupt biological control, especially aphid predators and parasitoids. Lannate is not labeled in Canada but it has the same tolerance on fruit as in the U.S.
Where PC is an issue, we are suggesting use of Avaunt as a base spray 1st post-pollination (PC and CBFW) with an added or 2nd spray of Actara for aphids, (which also has PC activity) if aphids are a concern.